Iowa « R-V There Yet? We’ve thawed out from the record setting low temperatures in the Quad Cities to continue with our investigation of the area. 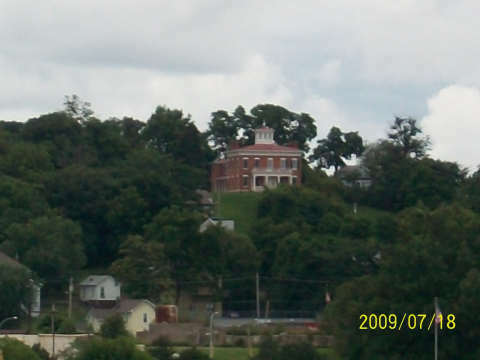 The Quad cities consist of Rock Island, Moline, Davenport and Bettendorf which are in the states of IL and IA. We saw a sign welcoming us to East Moline, IL. 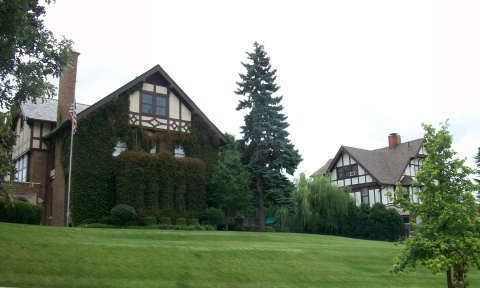 which claimed to be part of the quad cities, but what would it then be called, the Pent Cities? 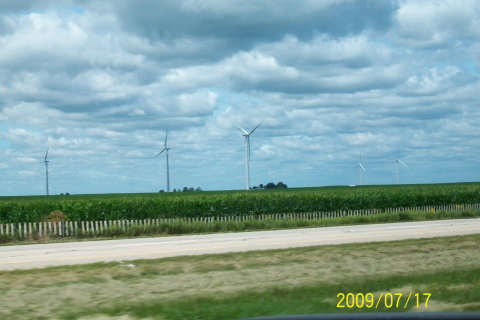 On our way through the countryside heading in to town, we spotted a lot of corn and a windmill farm that appeared to be out of place. Anyway, we wandered up and down the shore of the Mississippi on both sides. 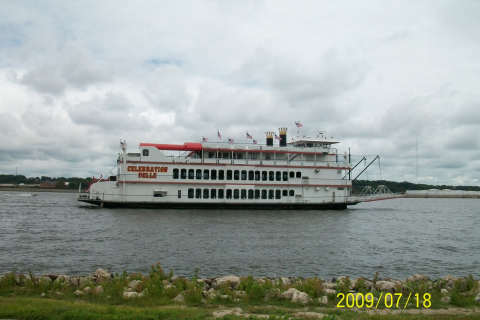 We spotted a river boat, the Celebration Belle, that gives tours from Moline to as far away as southern Minnesota. 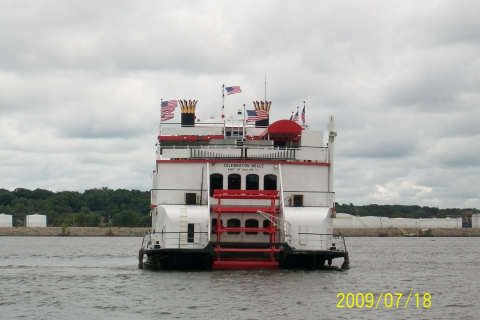 You can tell by the size of the paddle wheel that it is only for show. As a matter of fact, it doesn’t even touch the water. 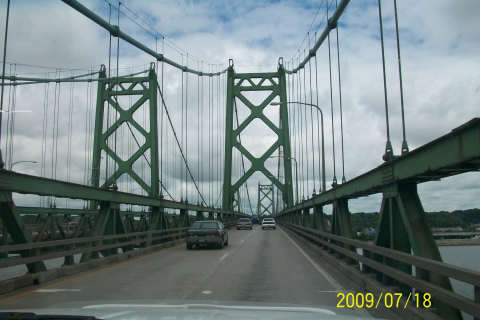 There are several bridges across the Mississippi in the area. Most have very narrow lanes. 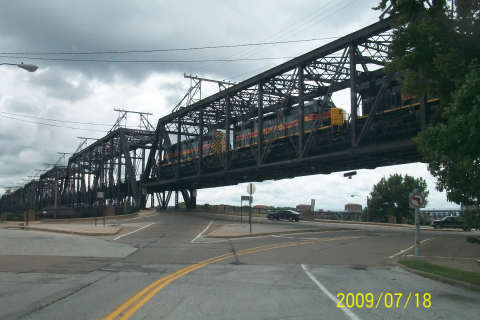 The bridge across the river near the Rock Island Arsenal is a multi-layered, multi-use structure. The top level is for trains. 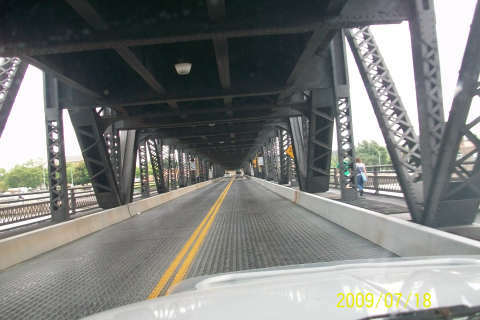 The lower level is for auto traffic. It is not for claustrophobics, especially with a 3-engine freight train rumbling overhead. 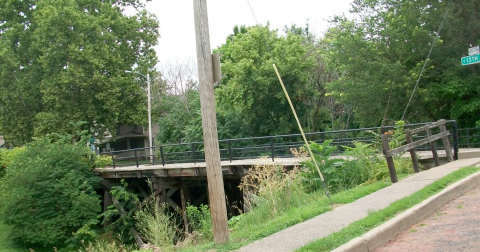 While on the subject of bridges, here is a wooden bridge that is still being used for motorized traffic. There are no signs restricting the weight of the traffic. We elected not to cross this one. There is something about a river town that is unique. 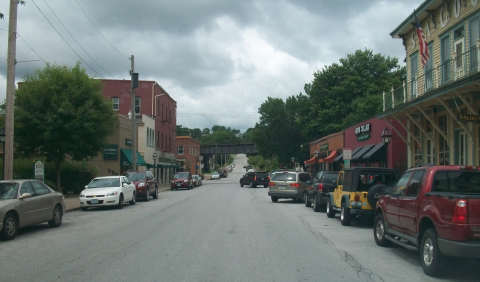 It’s great to see communities where all of the old buildings are still in use. 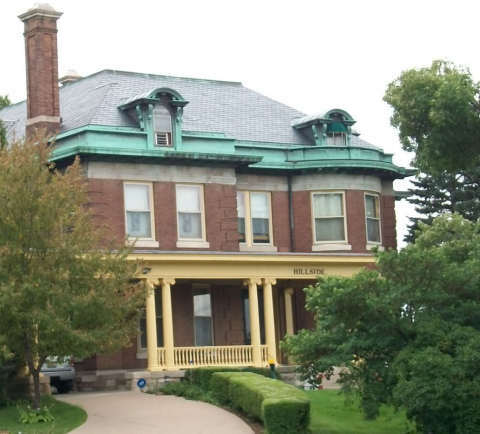 Having grown up in old houses and owned one myself that was built in 1850, I love to see these fantastic old homes. These people are really into vines. I don’t know what it has done to the mortar. Some homes even have names. This one is named Hillside. 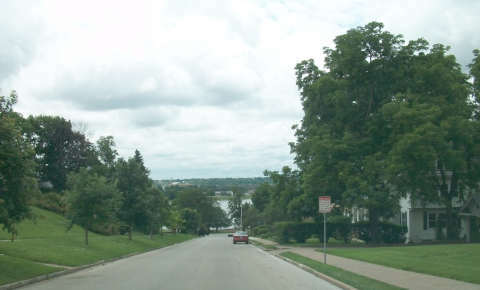 The neighborhoods along the river are built on a fairly steep hill. What do you think of their view of the river? 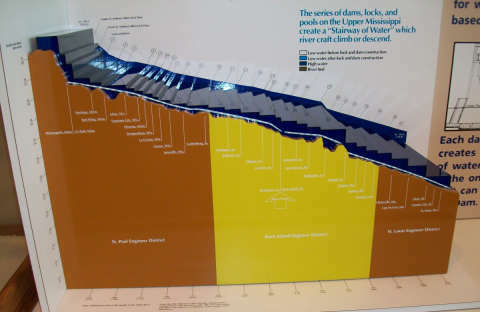 The level is controlled by a series of locks and dams. 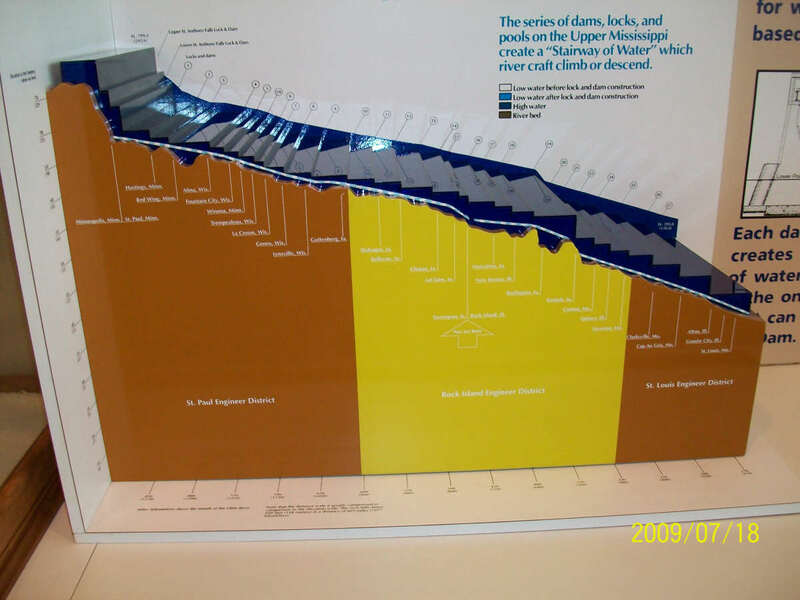 The largest drop is the one of 49 feet. 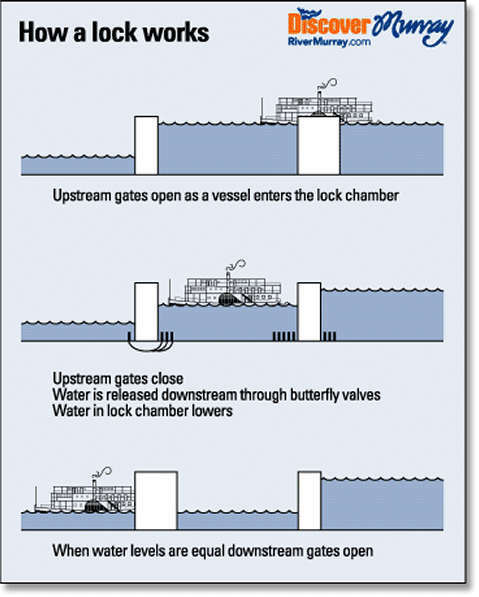 The lock system works on gravity, the lock is filled from water from upstream then released downstream to lower the level. 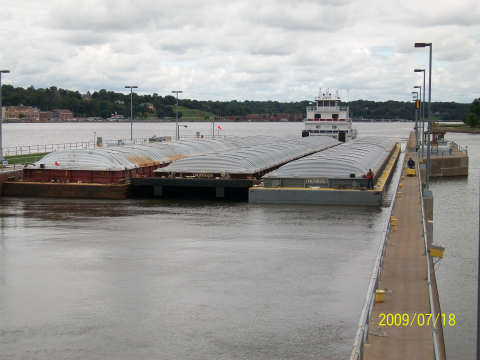 A group of barges on a downstream voyage wait for the water to fill the lock. 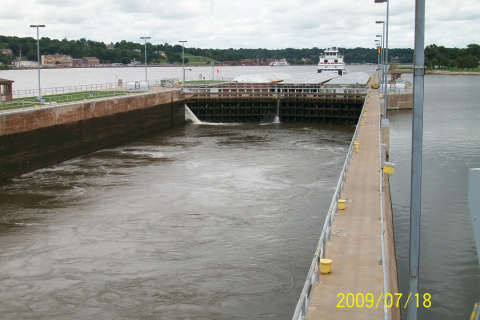 Once the water level above the dam has been reached, the gates open and the barges move into the lock. 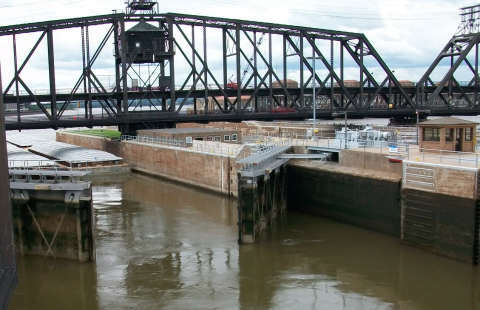 Once in the lock, there are only a few feet one each side of the barges. 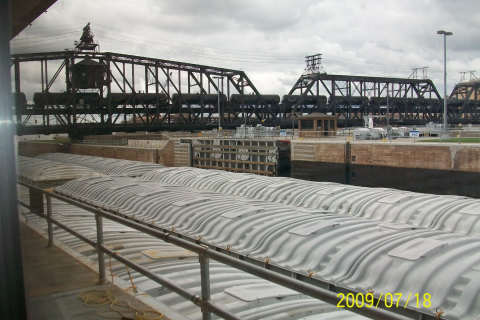 When the lower level is reached, the downstream gates are opened, the barges move out and the gates re-close. The entire cycle can take as little as 20 minutes. 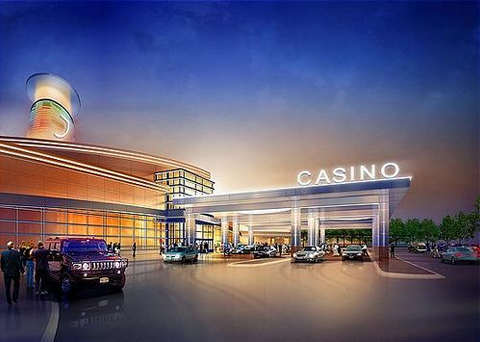 While in the area we checked out the Jumer’s Casino in Rock Island. It wasn’t as profitable as the River Queen in St. Louis, but we at least broke even. The lunch buffet was excellent and quite reasonable. You are currently browsing the archives for the Iowa category.